An entire book could be written on navigating the Paris Charles de Gaulle Airport. This article will map only the information I know from personal experience. 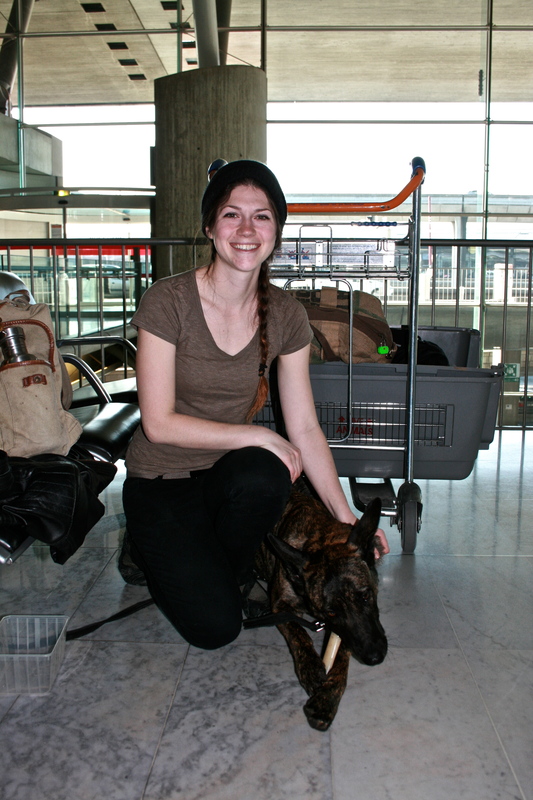 The thought of finding your way with luggage, a crate, and a dog in tow can be a daunting prospect, especially if you are traveling solo, but Zala and I made it from Paris, France to Chiang Mai, Thailand and I’ll tell you how we did it. It is best to prepare in advance and print out a map of the airport, you can find a basic layout map here. Zala and I arrived via the TGV train. In France, a dog ticket is half the price of your adult ticket, and dogs are required to be leashed and muzzled on the train. I have a 65lb Dutch Shepherd, and I have found that it is easiest to take a seat next to the luggage instead of my assigned seat if the train car (voiture) is crowded. Most trains to Paris are. My leashed dog walked alongside me from the train up until the moment I sent her away as luggage. Do not feel obliged to keep your dog in his/her crate while navigating around terminals and shuttles, you’ll only give yourself a headache and a backache. The TGV train arrives between terminals 2D and 2F. If you feel like gambling and taking the train the morning before your flight, check online for any ongoing train strikes that may cause you unexpected delays. In my case, there were train strikes the days prior, and I chose to arrive in Paris the evening before my flight. There are numerous choices for hotels around the airport, but the cheapest option, actually within the airport, was Ibis Hotel. To get to the Ibis Hotel, there is the CDGVAL shuttle that stops at all three terminals. From the TGV station, you need to take the lift up to the 4th floor. From there, simply follow the signs and take yet another lift. The Ibis and Hilton are located next to terminal 3. There is plenty of grass outside of terminal 3 and the Ibis Hotel for pet bathroom breaks. The pet fee for the Ibis Hotel was 5 Euros current as of March 2014. 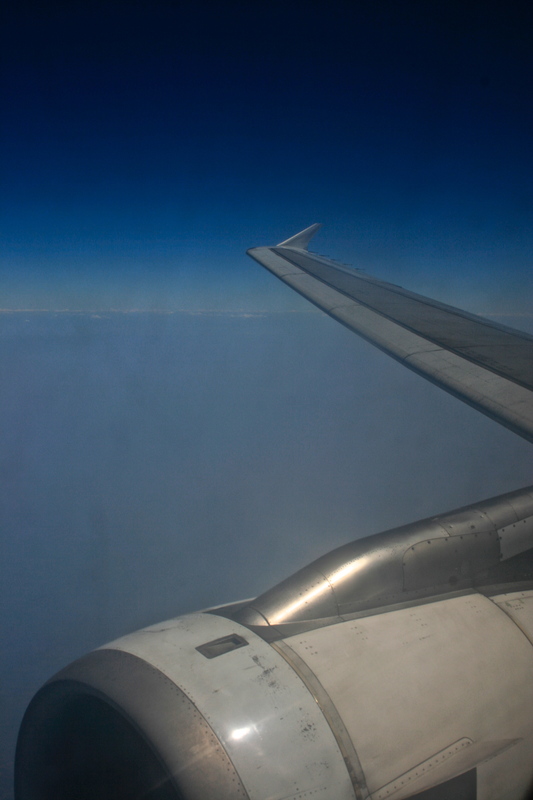 AirFrance was our airline of choice this trip. AirFrance departures are located in terminal 2F. Going from terminal 3 to terminal 2F with a large dog crate, two duffle bags, and an excited dog took no longer than 20 minutes. A forewarning, trolleys are blocked from going on the lifts that go up and down to the CDGVAL shuttle. This leg of the journey will require extra time and manual lifting if you do not have help. After that, there are the long stretches of walking that the Paris CDG is famous for. Individuals checking in with a dog will receive their boarding pass after they have paid and checked-in their dog, so don’t bother with the ticketing machines. Dog check-in should be done several hours in advance. My flight was at 1:50, and I checked my dog in at 11:00. 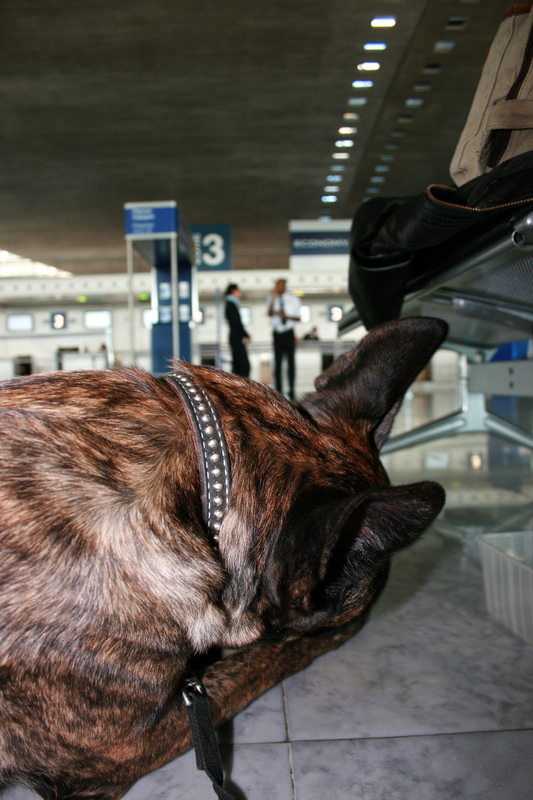 To start, check your dog and any extra baggage in at the luggage counter. The attendant will inspect the cage, give you a waiver to sign, and put your baggage sticker on the crate. To my surprise, my dog’s health certificate was never checked. Afterwards, you will need to go to the ticketing office to pay for your dog’s fee (200euros to Thailand) and get your boarding pass printed. Finally, you will need to travel further down the terminal to #5 to drop off your oversized luggage dog. It took well over an hour before she was actually crated and we said our goodbyes. After you have finished with the dog, it is your turn to go through the grueling process of customs. I will mention, yet again, how important it is to give yourself plenty of extra time. My gate was changed from terminal F to hall L. An entirely different hall with a lot of extra unplanned walking to get there! But if you do have extra time, terminal 2 has enough to keep you amused during your wait; including video games, wifi (first 15 minutes are free), and massages. Upon boarding, there is a waiver to be handed to the stewardess. My boarding pass did not scan properly until I handed this waiver to her. This paper essentially said that my dog’s crate complied with the safety standards of AirFrance. After that, it was smooth flying on a direct flight, and my dog was waiting for me in Z3 oversized luggage at Suvarnabhumi Airport in Bangkok, Thailand. See my post on Suvarnabhumi Airport for information on collecting your dog, getting through customs, and catching another flight on a Thai airline. Just found your blog as I will be traveling through CDG on my way to the US from Central Africa. I was wondering if you have to go through customs/etc to get to the IBIS hotel from the actual terminals. I have a 7 hour layover, and Diego (my chihuahua) doesn’t have an EU passport to actually leave the airport. Any chance we’ll be able to potty at IBIS? Thanks so much either way- love when people share info! You can get to the IBIS hotel from the terminals, but your chihuahua will need to clear customs unfortunately. An EU passport is not necessary to clear your dog out of the airport, but I don’t know if your paperwork will be enough to meet France’s requirements. I am unfamiliar with export standards from Africa. But yes, there is grass around IBIS and the terminal next door for a potty break. Thanks a lot for this useful information. I am traveling in two weeks from Copenhagen to Bogotá with stopover in Paris. I have booked the ibis hotel for me and my 40 kilos Labrador Retriever. I am wondering how is the mobility between terminal 3 and the hotel. I am traveling alone and I have 2 luggage also. Can I get a trolley from terminal 3 to take the tunnel and reach the hotel? Thanks a lot for sharing this! I am regaining a little hope – I have been searching for 3-4 weeks (!!! ), because I am moving from Madagascar to Nicaragua and want to take my 2 adopted, medium-size Malagasy half breed dogs with me… Every time I think I have found an itinerary, either the airline does not transport pets on this leg, or they have to be transported as manifest cargo (which may cost more than a business ticket for their mistress!). As for Central Africa, it is certainly the same as for Madagascar: These are countries with a high rate of rabies which means the new CEE rules have to be strictly followed: 1) insert microchip 2) vaccinate rabies (in this order!!!) 2) after 21 (?) days min. a blood test has to be taken, locally converted into serum and sent cooled (!) from the African country to an agreed laboratory in France… The result should give a value of more than .5 (rabies antibody). This test must be carried out 3 months before departure. Some other vaccinations/tests must also be carried out (Leishmaniose etc). And the dog must be accompanied by an official EC Health Certificate together with the complete documentation of all these vaccinations, tests etc. I have been searching for the shortest and less complicated itinerary, but via Jo-Burg they have to travel as manifest cargo and would be blocked in Atlanta, because DELTA does not take pets on the direct flight to Managua. Now I am again checking for AF via CDG, but was told the pet transit zone in CDG airport is currently closed. I understand that countries want to protect themselves against rabies and other diseases, but organizing such an itinerary for a dog is more stressful and complicated than for a group of 20 travelers from different countries. Still not sure if it is finally feasible, because it is also a lot of stress for the dogs (my “Tarzan” is panicking when he sees the vet who is really good with dogs and has 5 himself). Bu when I look into their eyes, I find it difficult to leave them behind with a new mister or mistress who furthermore will be difficult to find for dogs of 2 and 5 years. So please, please cross your fingers for me that I will finally find a way to make this work! THANKS!